[SatNews] Missions in remote, forward operating locations often suffer from a lack of connectivity to tactical operation centers and access to valuable intelligence, surveillance, and reconnaissance (ISR) data. The assets needed for long-range, high-bandwidth communications capabilities are often unavailable to lower echelons due to theater-wide mission priorities. DARPA’s Mobile Hotspots program aims to help overcome this challenge by developing a reliable, on-demand capability for establishing long-range, high-capacity reachback that is organic to tactical units. The program is building and demonstrating a scalable, mobile millimeter-wave communications backhaul network mounted on small unmanned aerial vehicles (UAVs) and providing a 1 Gb/s capacity. DARPA performers recently completed the first of three phases in which they developed and tested key technologies to be integrated into a complete system and flight tested in subsequent phases. Smaller, steerable millimeter-wave antennas: During field testing, the program successfully demonstrated steerable, compact millimeter-wave antennas that rapidly acquire, track, and establish a communications link between moving platforms. Steerable millimeter-wave antennas will enable the formation of a high-capacity backhaul network between aerial and ground platforms. Low-noise amplifiers: Performers also demonstrated an advanced low-noise amplifier (LNA), which boosts the desired communications signal while minimizing unwanted noise. The prototype achieved the record for the world’s lowest noise millimeter-wave LNA at about half the noise figure of a typical LNA. More efficient and capable power amplifiers: Efficient millimeter-wave amplification is required to achieve the long ranges (> 50 km) desired in the Mobile Hotspots program. During Phase 1, performers demonstrated output power exceeding 1 watt and 20% power added efficiency (PAE) from a single gallium nitride (GaN) chip operating at E-Band frequencies (71 GHz to 86 GHz). Output powers exceeding 20 watts and approaching 20% PAE were also achieved using power-combining techniques. New approaches for robust airborne networking: Mobile ad-hoc networking approaches were developed to maintain the high-capacity backhaul network among mobile air and ground platforms. Phase 1 performers developed unique solutions to overcome connectivity and network topology challenges associated with mobility and signal blockages due to terrain and platform shadowing. 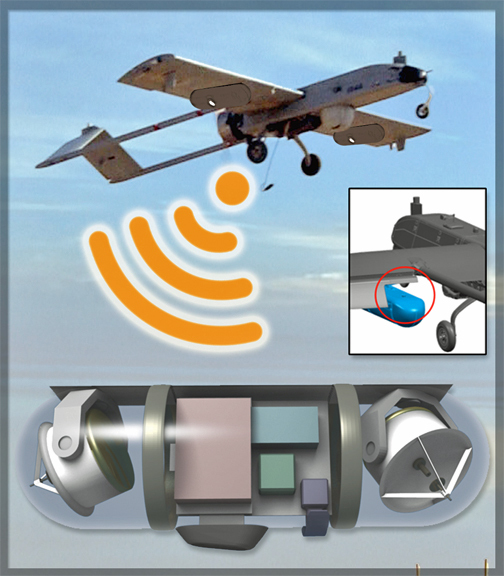 Low-Size, Weight, and Power (SWAP) pod design to carry it all: Performers created engineering designs for small, lightweight pods to be mounted on an RQ-7 Shadow UAV. The pods, with all of the Mobile Hotspots components inside, are designed to meet the challenging program goals of widths no more than 8 inches, weight less than 20 pounds, and power consumption less than 150 watts. Phase 2 of the program began in March of 2014. Two performers, L-3 Communications and FIRST RF, were selected to lead teams comprising several Phase 1 performers. Phase 2 goals include the integration of the selected Phase 1 technologies into Shadow-compatible aerial pods and ground vehicles. Phase 2 will conclude with a ground demonstration of at least four Shadow-compatible pods, two ground vehicles and a fixed ground node. A planned third phase will encompass field testing of the Mobile Hotspot systems on networks of multiple SRQ-7 Shadow UAVs and mobile ground vehicles.